I don't know what kind of plant that is. But I know it is so beautiful in front of the library of our uni. 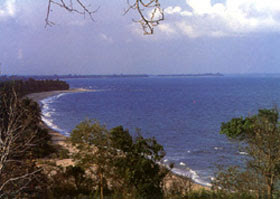 Chaung-tha Beach is located 40 km to the west of Pathein in Ayeyarwaddy Division. pink fairy lilies in front of our Uni. Although I don't know their names , I love them in my garden. Pineapples beside the Engineering Building of our uni. Origin: The pineapple is native to southern Brazil and Paraguay where wild relatives occur. It was spread by the Indians up through South and Central America to the West Indies before Columbus arrived. In 1493 Columbus found the fruit on the island of Guadaloupe and carried it back to Spain and it was spread around the world on sailing ships that carried it for protection against scurvy. The Spanish introduced it into the Philippines and may have taken it to Hawaii and Guam early in the 16th Century. The pineapple reached England in 1660 and began to be grown in greenhouses for its fruit around 1720. My little brother sent me this photo. That is temple tree (or) plumeria tree (pink colour) .That tree is leaning on the wall of Mechanical Engineering building in my uni campus. Common Name: plumeria tree, temple tree, West Indian jasmine or frangipani. This shrub or small tree is native to Mexico, and is well-known for its strongly perfumed flowers that can be of several colors. The plumeria tree has alternate, linear and lanceolate leaves. They are glossy and dark green. They can be up to about 12 in (30 cm) long, and will fall during the dry season. The temple tree generally blooms from spring to fall. Flowers are pleasantly and strongly perfumed, and can be of different colors (white, yellow, orange, pink, red). The flowers are grouped at the tip of the branches. I am surprised when I see the advertisement on my blog. This is my mommy's orchid! My mommy bought it from nursery. Although I don't know its name, I love those small white flowers in my garden. My favourite little pink puff ! When I touch them, they fall asleep. The leaves fold up when touched. If touched with a bit more force, the petioles will also bend at their pulvinis and the leaves droop. These movements are called seismonastic movements (reaction to physical shock). At night, the leaves will also fold and bend in movements known as nyctonastic movements (reaction to absence of light). This is magnolia (white colour) in our uni campus. That tree is a little high and I can reach only the lower branch to take this photo. I am not a good photographer. You see? Pindaya is a small quiet town perched on the bank of the placid Botoloke Lake. 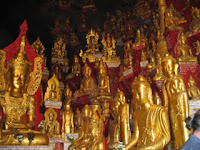 The Pindaya cave, containing thousands of Buddha images, is the main destination in this region. 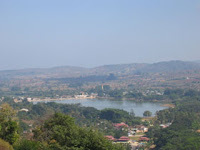 Pindaya is a small quiet town perched on the bank of the placid Botoloke Lake. Pindaya cave is a huge cavern where hundreds and thousands of Buddha images in various size and shape are installed since the 11th century. The winding galleries and nooks and corners are ideal places of insight meditation since the olden days. Huge monastery compounds with numerous pagodas and temples in different stages of dilapidation are much respected by such ethnic groups as the Shans, Danus and Paos living in the environs of Pindaya. Sagaing is the capital of Sagaing Division in Myanmar. It is located on the Ayeyarwady River, 20 km to the southwest of Mandalay on the opposite bank of the river.Sagaing is a religious and monastic center, with numerous Buddhist monasteries. It briefly regained is position as a royal capital of Burma from 1760-1764.The British-built a 16 span Innwa Bridge connects Sagaing with Mandalay, crossing the mighty Ayeyarwaddy River. It was built in 1934. Bagan is the main tourist attraction in Myanmar. One of the richest archaeological sites in Asia, it is located on the eastern bank of the Ayeyarwaddy River. Also being the capital of first Myanmar Empire, Bagan covers an area of 42 sq. km containing over 2000 well-preserved pagodas and temples of the 11th -13th century. This vast picturesque lake, 900 metres above sea level, is one of the main tourist attractions in Myanmar. The lake, 22 km long and 10 km across, has a population of some 150,000 many of whom live on floating islands of vegetation. Inlay Lake, natural and unpolluted, is famous for its scenic beauty and the unique leg rowing of the Inthas, the native lake dwellers. Mrauk Oo is the capital of the Rakhine Kingdom, which flourished from the 15th to 18th century. This 15th century ancient for its old temples with wall paintings of Indian cultural influence. Mrauk-Oo is noted for its fort-like temples and pagodas of stone and brick; and for its statuary and relief, which are distinctive.